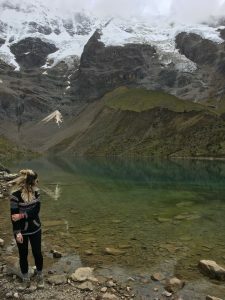 There are a number of ways that I could describe my fifteen-week journey to Peru – an amazing adventure which often times all seems like a blur to me now. “How was your trip?” is the most common question I’ve been faced with since my return – one that I expected, and yet still have trouble answering. “There’s not enough time in the world to tell you all about it,” I say. Sometimes, I confess that it all went by so quickly – that it feels like I never even left. Still, I find myself saying that my trip was busy, as I spent most of my days working hard to meet deadlines, or travelling back and forth from airports or bus stations early in the morning to get back to work on time after weekend getaways. When including it on my CV, I will probably write about how this was the summer in which I developed my research skills, perfected my Spanish, and learned about national and international human rights protection through my contributions to reports, events and other projects with the IDEHPUCP. My friends know it as the unforgettable trip where I managed to live by myself in a foreign country, made friends from all over the world, and climbed a countless amount of mountains – both physical and figurative. To me, this was the summer where I learned how to sing. In Lima, life is always bustling – cars and busses honk through stop signs instead of actually stopping, bus drivers scream the route out of the window instead of having a formal system like we have here in Montreal, and nearly everyone listening to music fearlessly belts their hearts out as they sing along, no matter where they are. I was shocked the first time I heard my colleague – who later became one of my best friends – singing her favourite reggaeton music in the middle of the office on my first day. I rolled my eyes and chuckled as the person behind me during the walk to the grocery store sometime early on in my trip sang and danced to his music. In Montreal, this would be seen as obnoxious and disruptive – but in Lima, it was a form of expression that had not yet become taboo or subjected to the social expectation that, in public or at work, one must be discrete. Where I was used to being expected to fit into a set of social standards, to mold into the rest of society and stay in the shadows, they would charge forward in individuality and expression, full of life and heart-warming spirit. It wasn’t long before I stopped jumping in surprise when someone in the Institute’s academica department broke the concentrated silence of the area with a few words of one of the summer’s top hits, and instead, started smiling and dancing along to their melody. Their voices and music ended up being the soundtrack to my summer, characterizing my walks home, my evening dinners with my Peruvian family as they sang “El gato nero” to their one-year-old son, and, of course, my time at work. 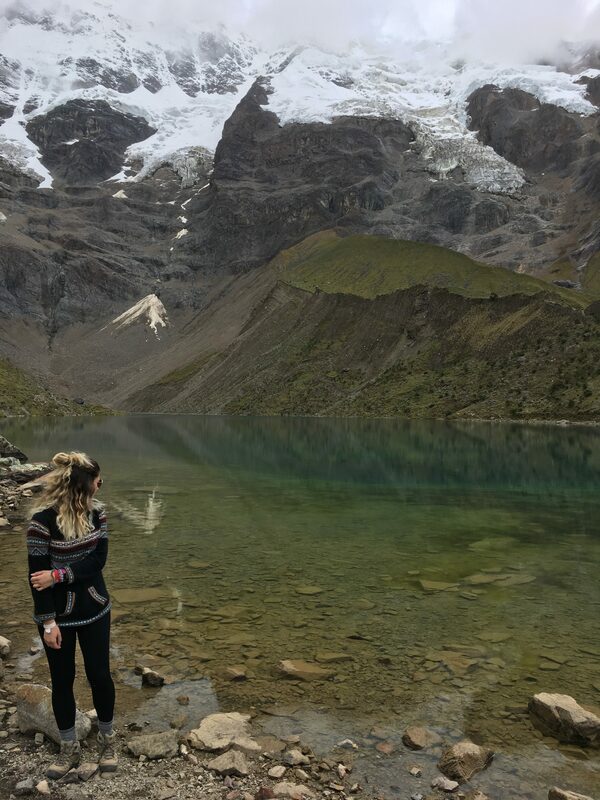 As this aspect of Peruvian culture lost its foreignness, my initial role as the young, shy Canadian intern terrified of speaking Spanish at the risk of sounding stupid slowly morphed into one of sociability and confidence. The country that once seemed so distant from everything I knew began to transform into a home – or as my colleagues and I liked to call it, mi patria. 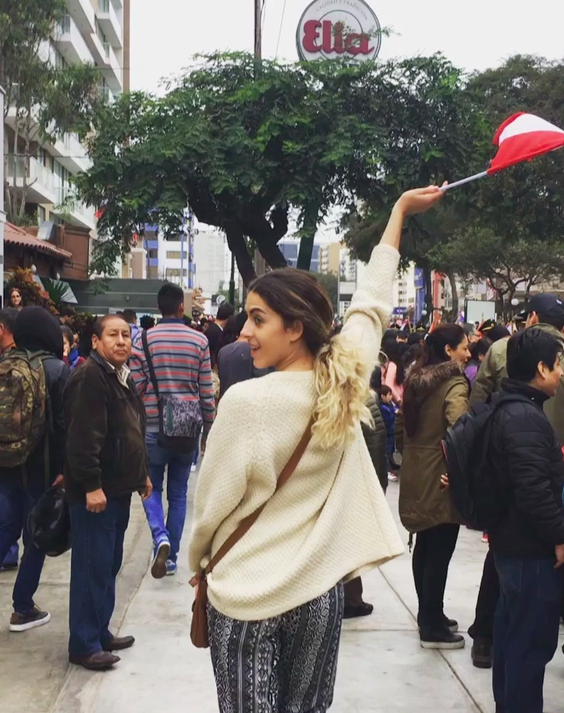 On Peru’s independence day, I attempted to belt out their national anthem. I joined in many birthday celebrations at the office in which the entire Institute gathered around to sing “Happy Birthday” in choir around a large strawberry shortcake from the bakery down the street. Eventually, I even found myself humming along to my music as I typed. What at first glance appeared to be an example of the care-free stereotype we often associate to Latin American culture eventually revealed itself to be a beautiful expression of happiness, confidence, and hope. A life in human rights research, I quickly realized, can be a daunting one. The nine-to-five work days, which often dragged out to nine-to-eight days during busy periods, are a constant realization of the terrible things that occur around the world, sometimes as close as within the city you work or live in. Every hour is filled with reminders that the world can be a terrible place for some, and that having the opportunity to advocate against human rights violations is a product of your privilege to not be on the other side of them. When one project ends, it’s on to the next one, dealing with similar hard realities, only with regards to a different violated right, and rarely with any assurance that the work you submitted will ever make it into the hands of a policy-maker, or even make a dent in the international hardships you are trying to alleviate. Most of the time, all you can do is hope that what you invested your heart and soul into makes a difference, even if by just raising awareness about the issues around you, and keeping pushing forward until the change you work for finally comes. And so, they sing. I had never worked in human rights before my experience in Peru. I now have the utmost admiration for those who do – who dedicate their lives to making the world we live in a better place, if only for some. On my last day of work, I submitted my final project, took pictures with my friends in the department – who I would see later for a final goodbye party – and emotionally emptied my desk. As I left, I closed the mahogany doors of the Institute behind me for the last time. I hugged Señor Ochoa, the security guard that greeted me every morning, goodbye. During the walk home, I sang along to Ed Sheeran’s Perfect. Published by melisademir on September 10, 2017 at 11:16 am under Arrivals and departures. 1 comment. It took about half an hour and many WhatsApp phone calls – all of which served as a stark reminder of just how different the language in in a Spanish-speaking country was from the Spanish I had learned in high school – before I finally met up with Rodrigo, my driver. 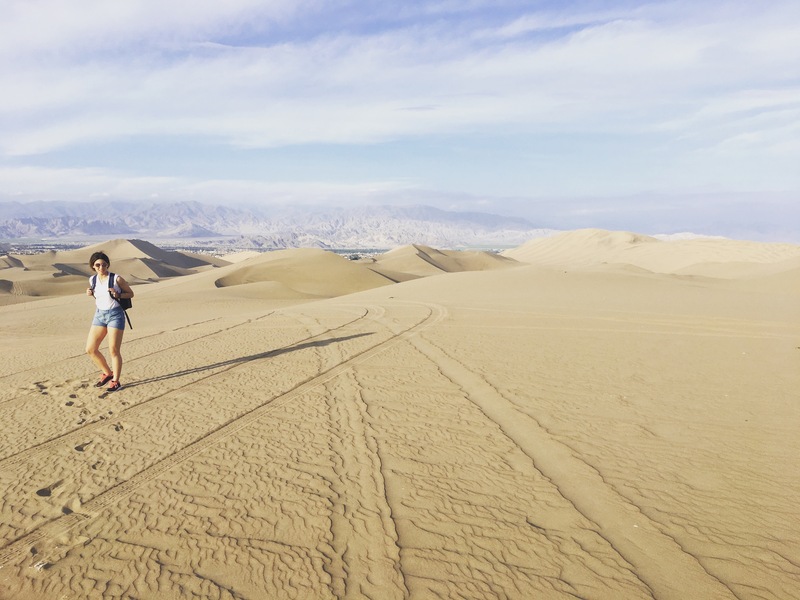 I threw my suitcases and my backpack into the trunk of his grey Hyundai, almost exactly like the one my parents drive at home, and hopped into the backseat, ready for what I knew would be the adventure of a lifetime. A lot has happened since that first day. The sun that I was met with when I first stepped through the airport’s sliding doors has started to disappear, making only its signature rare appearances as “the Grey city” falls into its winter months. 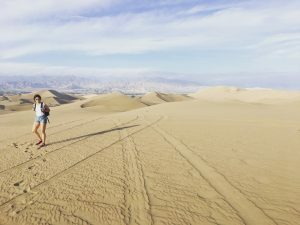 I’ve seen penguins and sea lions off the coast of Paracas, sand-boarded down the dunes of Huacachina, rafted through valleys in Arequipa and spent five days hiking through glaciers and the high Peruvian jungle to the beautiful Machu Picchu. I’ve finally figured out how to properly unlock the front door of my apartment after too many hours spent on the verge of tears, locked out with my groceries lying on the front steps. The family that I once knew as simply Kat and Gus from AirBnB have become like my second parents, including me in their family celebrations and mornings to the market, sitting with me at dinner, and teaching their one-year old son to walk towards me and, occasionally, roll me his ball. On top of Machu Picchu after 5 days of trekking! Of course, I have also become quite familiar with the corner desk I was given at the Institute of Democracy and Human Rights (IDEHPUCP) – once empty, its drawers are now filled with notes bearing my handwriting, the airplane headphones I use to drown out the sound of my coworkers’ singing when I need to concentrate, the books on human rights I have read since my first day, and the box of vanilla cookies I bought from the grocery store down the street to snack on with my afternoon coffee. Since the beginning of my time here at the IDEHPUCP, I’ve had the opportunity to learn a lot about many different aspects of international human rights law – particularly, I’ve studied the notion of corporate responsibility in international law, participated in discussions on corruption in Peru, and helped the Institute run two parallel events on rethinking gender roles in Latin America and on the continued reality of human trafficking in the area. Yet, in these past three weeks filled with great learning opportunities, two lessons have stuck out to me so far: be patient, and stay fearless. My internship at the Institute began with a warm welcome from the entire IDEHPUCP family – I was given a tour of the different departments, greeted with a signature one kiss on the cheek or a dynamic wave by everyone I met and even invited to the Institute’s events during my first week, as if I had already become one of the team. However, my work also began at a time where the organization of two of the Institute’s biggest projects (hosting two conferences within the same week) was just nearing its end – a time where there was just enough work for those who had already been involved in the preparation of these events to keep busy, yet not enough for me to join in too extensively. As a result, for my first two weeks of work, I was only given two books to read – one on the effects of international law on corporate activity, and another on the functions of the Inter-American Court of Human Rights – and some translation work from Spanish to English. I began to worry if my Spanish skills were seen as not strong enough to handle more heavy workloads, or if my lack of experience in human rights law deterred my supervisors from including me in big research projects. Then came the week of the events, and I quickly found myself busier than ever, running around the University campus making sure everything was running smoothly, being tasked with small jobs here and there. I even had my first of what I expect to be many late nights within my legal career, when I was asked to help a colleague find information on the biographies of the events’ panelists due the following morning. Since then, my days at the Institute have been filled with a variety of different tasks, making every moment spent at work unique – in addition to my translation work, I have been assigned to do research on the international and national protection of elder rights, have co-written an article on labor rights violations within Peru which was published on the Institute’s website, and, most recently, have been asked to help with a jurisprudential study on recent constitutional decisions in the country. Not only has my work life gotten busier, but my Spanish has already improved tremendously, giving me the confidence to start coming out of my shell more, going to more social events and becoming good friends with my colleagues. Lima really is starting to feel like home – so much so that the barista at the Starbucks on my way to work has started to greet me with “Hola Melisa, que tal?” and knows my order almost by heart. Life in Lima is not nearly as different than life in Montreal as I thought it would be – its streets are bustling with busy buses and cars and large boulevards lined with shopping malls and gourmet restaurants, and its nightlife in Miraflores and Barranco rivals that on Blvd St-Laurent. One of the biggest culture shocks for me was definitely learning to take a breath, and coming to terms with with not having heavy workloads all the time. I grew up in a culture where I was taught that being hardworking and being productive often meant being busy every second of every day. Here, things are different: being a good employee is more about being available to lend a hand to your teammates when they need it, and doing everything you do, no matter how little work you’re given, as best as you can. All in all, I have definitely come a long way in my month by myself here in Lima, and most of my adaptation happened simply with time. I have come to realize that the IDEHPUCP is largely a place for learning – my supervisor ensures that every project I am given can somehow tie back to Canada, even in the smallest way. One of the biggest lessons I have learned so far is how to be patient, to wait for my opportunities to arise (or even to create my own), and, in the meantime, to take advantage of the little things this internship has to offer, such as the experience of simply being in one of the most important research centres in the country, learning from some of the most dedicated human rights workers in the area, and being able to help out with their work, even in the simplest ways. Like many people I know in McGill’s Law Faculty, I came to law school mainly driven by a love and passion for international law and human rights. Also like many in my Faculty, I have become well aware of how difficult pursuing a career in this field will be. My experience so far at the IDEHPUCP has opened my eyes to the merits of pushing through obstacles and overcoming seemingly impossibly high mountains – of always staying fearless, whether it be when crossing the street in Lima’s busy traffic, swallowing my pride and joining in on conversations and social events with my colleagues even when I still sometimes have trouble keeping up with the local jarga (Peruvian slang), and most importantly, when making decisions about my future career choices. Here at the Institute, I spend most of my time immersed in a culture of devotion and passion for human rights work. I watch my colleagues, some of which are still students, juggle their work with their studies, running back and forth from the Institute and the PUCP campus, putting their theses that they need to complete in order to graduate on the back-burner in order to complete what they see as more urgent tasks, like writing up on pressing human rights issues or conducting studies on international law. 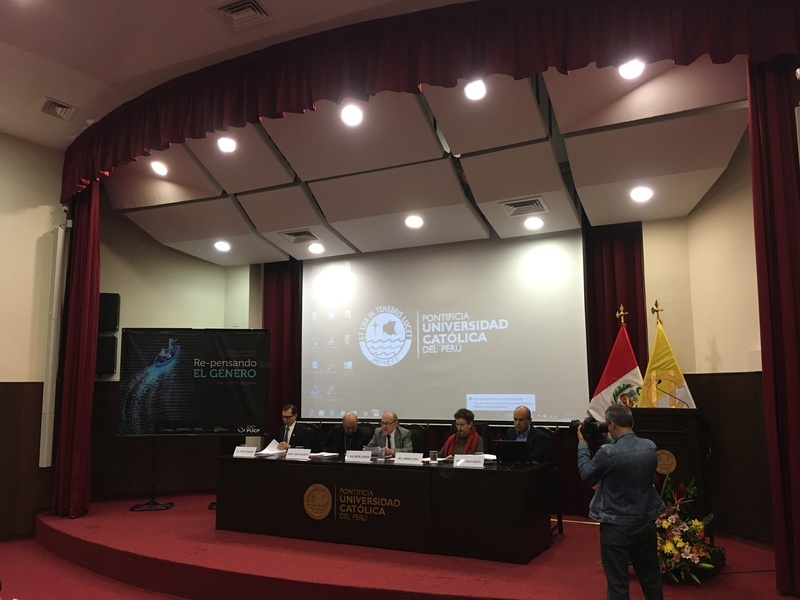 During the panel on Gender Rights, I watched the head of the Institute, Doctora Elizabeth Salmón – one of the most respected and successful people in the field of international law and human rights law in the country – defy social norms by setting up a panel on the continued struggle to find balance between the protection of women’s rights and LGBTQ rights and religion in Lima. Everyone at the Institute, I have come to realize, spends the better part of their careers making sacrifices for the bigger cause of defending human rights, both within their country and beyond. They are all fearless in their work, not only because of their passion for their jobs, but because they know that what they do needs to be done in order to make a change – no matter how difficult, or scary, it may be. As the halfway point of my time here at the IDEHPUCP approaches, I am already so grateful for all of the experiences this internship has brought me, and for all of the important lessons that I’ve learned, and will continue to use in the future – wherever my career, and life in general, take me. Published by melisademir on June 29, 2017 at 4:48 pm under Arrivals and departures. 0 comments.